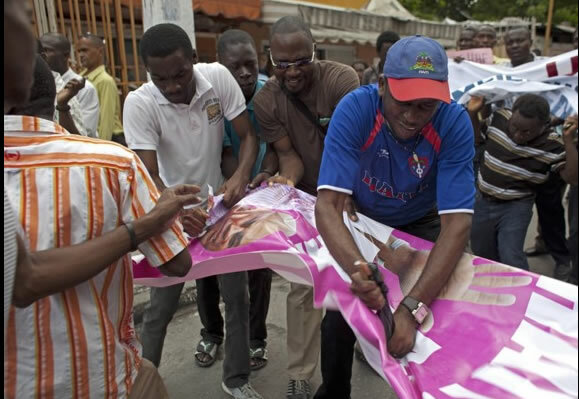 Fanmi lavalas as well as the group G8 are preparing for more disturbances in Haiti for the coming days. Fanmi lavalas announced two days of protest for today (12/3/15) and Saturday in the objective to continue to demand that the CEP respect the votes of the population. They intend to join their efforts with the G8 who also announced two days of protest for today and Saturday as well. In addition to the two day protest, the group G8 has also announced a strike for Monday, December 7. They are demanding the departure of the government of Michel Martely. grèv pwograme pou jou ki ape vinian an Ayiti. Fanmi Lavalas ak G8 gwoup ap prepare pou plis latwoublay an Ayiti pou jou kap vini yo. Fanmi Lavalas anonse de jou pwotestasyon pou jodi a (12/3/15) ak Samdi nan objektif pou l kontinye mande ke CEP a respekte vòt popilasyon an. Anplis de pwotestasyon pou de jou, G8 gwoup te anonse tou yon grèv pou Lendi, Desanm 7. Yo ap mande depa gouvènman Michel Martely.